Tantrikas Julia and Tara share their experience of this year’s Glastonbury Goddess Conference, healing wounds of The Mother and calling back the energy of the Goddess to the land and people of the UK. 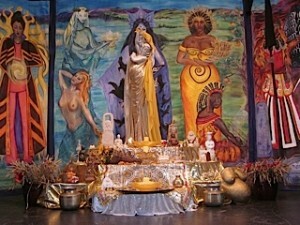 I have been involved with the Goddess Movement for about six years. Being a part of it has helped me to create my own pick and mix of aspects of the feminine, to look at the parts of woman that I was ready to examine in myself. Each one had its challenges, some I found I already knew well, which came in like old friends. My big avoidance had been ‘Ker’, The Mother. It is one of the hardest areas to look at in our lives with absolute honesty. The conference was an invitation to walk into some of those places in our memories, where the door has been shut for a very long time. The sharing of women talking about their experiences of their own mother, each one an archetype, something each person present could relate to in some way, gradually drew feelings of grief, joy, whatever came up. Being invited to examine our own experience of being mother to ourselves, our children and those we may have lost or never had, allowed for deep healing to take place. The progressive ceremonies held over the 5 days of the conference, took us on a journey of deep ritual, where trauma and grief could all be experienced and released in safe, held environment. Quite simply there is no other space I know of where several hundred women can create such a space and hold it in a way that allows healing, celebration and joy of what it really means to be a woman. It’s a deeply personal journey, yet one as women we all share and are so rarely given the space to explore. Ten years ago I attended my first Goddess Conference at Glastonbury. It was so amazing that I decided to train as a priestess and spent the following three years doing just that, sitting in circle with sisters, making and sharing, creating rituals and ceremony, out on the land, schooling myself in the old ways. All of this had been prompted by the Goddess stirring in my bones, whispering to me in my dreams, pulsing through my ecstatic body. In one dream she appeared as goddess of the mountain and held me in a love so fierce that it surpassed all understanding. This year I attended my first Goddess Conference for some years. I had been very much looking forward to working as a grain priestess but sustained a painful shoulder injury just a few days before the start of conference and had to stand down. Greatly disappointed though I was, I am not one to take things lying down and so with the aid of ice packs and Sidika’s miraculous scenar device I put my best goddess foot forward. The Goddess Conference, created by author, playwright and priestess of Avalon, Kathy Jones is held annually in Glastonbury at Lammas (August 1st). It’s now in its 18th year. 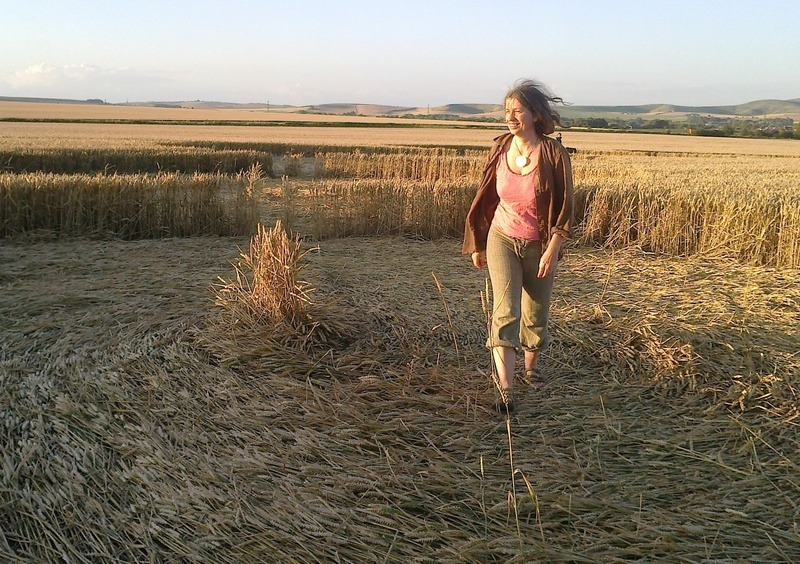 Each year a different aspect of goddess is celebrated and this year we marked the Lammas aspect of the South West of our wheel, mother Ker of the first harvest, reflected by the golden grain ripening in our fields. The conference is a week-long event during which the Town Hall becomes a pop-up temple, full of lavish altars, wall hangings and goddess banners. In fact, many of Glastonbury’s venues host the numerous events taking place. 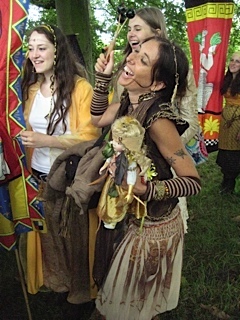 On offer are ritual walks into the Tor labyrinth, concerts, workshops, talks, art exhibitions, installations, a craft market and much singing, dancing and celebration. Participants are invited to join one of nine directional cornucopia groups, lovingly held by grain priestesses and young people are catered for in a tenth group. These groups provide a space for sharing, deepening connection and processing. Conference officially begins on Wednesday morning with a welcome from conference priestess Kathy Jones and a few words from the mayor of Glastonbury. This year this was followed by a fascinating presentation from doula, priestess, ceremonialist and workshop leader Katinka Soetens on the mysteries of motherhood. She shared with us the potential for ecstasy in childbirth and shared her own experience of encountering Goddess through the birth of her first child. The conference is energetically held by a ceremonial group which meets throughout the course of the year to kindle the energy of a particular direction and aspect of goddess as intuited by Kathy. The wheel we priestesses of Avalon work with is known as the wheel of Brigit Ana or Britannia. Generally, the centre of the wheel is occupied by the Lady of Avalon but this year there was a broader focus on Brigit Ana herself as mother deity of the British Isles. Whichever aspect of Goddess is being celebrated we also always celebrate the season of Lammas, falling as the conference does in that season. 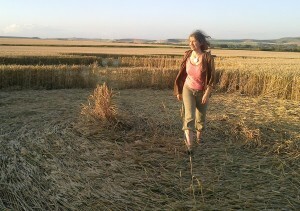 This year was a double whammy – Lammas celebrated at Lammas! Participants brought grain from their countries of origin which was ritually offered to Goddess, blessed, ground, made into dough, baked and then eaten in a true partaking of the original sacrament, the rites of Ceres, goddess of the grain, from whom the word ceremony is derived. This year the opening ceremony featured ceremonial priestesses caged, masked and hidden from view, guarded by a number of authority figures. A powerful, apocalyptic musical soundtrack was played. The scene was a clear representation of goddess energy imprisoned by patriarchy with reference to the atrocities committed over the centuries in Britannia’s name. At a pivotal moment in the drama the grain priestesses, sitting outside the cage bearing their cornucopias and baskets of grain approached the agents of patriarchy singing and overcame them with the power of love….The walls came down and the goddess was revealed. Britannia, ruling the centre was reclaimed as goddess of peace. Each cornucopia group then took it in turns to approach the priestess with their grain, singing the song they had written together. 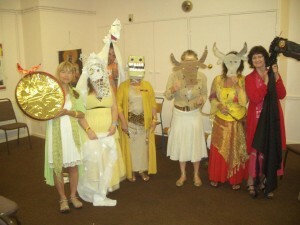 This was followed by singing and dancing, performance and participation. Highlights of Thursday for me were Kathy’s presentation on reclaiming Britannia from patriarchal powers, inspirational author Michael Dane’s talk on the mother mountains and goddess rivers of the British Isles as well as his informative and entertaining workshop on Horse of the Year. In lively and enthusiastic style Michael taught us about the horse as sun symbol in Welsh and Irish mythology. He actually managed to get us singing in Welsh while I played the piano, and we then went for a trot along the High Street in horse masks. On Friday (Healing the wounds of the mother) we entered the cauldron at the heart of the mysteries with a particularly powerful tryptych of presentations from Glastonbury priestesses, Georgina, Annabel and Tegwyn. Georgina spoke first in relation to her personal journey with her mother the Ice Queen. Tough though those lessons were she is testimony to the strength we can harness through adversity. Next Annabel shared the heart rending challenges she has faced with two of her children’s life threatening health conditions while Tegwyn relayed the tragic story of the death of her 6 year old daughter, killed instantly by a car over a decade ago. These were eloquent, honest, raw, deeply moving accounts in which we journeyed alongside them into the shadows as they shared with us the gifts they have found there. Each story so different, so exquisitely and sensitively related as these women bared their souls for us. That afternoon we participated in a ceremony of dance and vocal expression to heal the wounds of our mothering. This was led by Draupadi and priestesses and offered a space for expression and let go. Feeling delicate of shoulder I stayed to the side and let it all wash over me. That evening we entered the dreaming womb of creation at the heart of the mysteries for Goddess embodiment on a significant scale. Some 18 priestesses sat holding the circle, veiled and masked. Within the circle participants lay on sheepskins around the central grain altar. We were invited to visit the goddess as channelled by her priestesses, to receive the blessing of her love, to hear her words, to be embraced by her and then to partake of the sacrament, the sustenance she provides in the Prasad of the bread. I had witnessed the grain ceremonially presented to these same priestesses, I had watched Koko grind the grain by hand, I had helped add water and knead the dough ready for it to be baked and now I tasted the staff of life. It tasted truly sun blessed and I sensed the meaning of grace, the prayer intoned before each meal in gratitude. What I experienced in the arms of the goddess was total acceptance, soft cradling, gentle holding, the miracle of her love which expanded out to permeate the whole hall. Goddess presence was undeniable, her love palpable, her abundance in full effect. This was baptism, this was emergence into redemption in what for me was a true Tantric space of devotion, love and acceptance. Thus empowered from our journey into the shadows and into redemption, on Saturday we honed in on mother as sovereign with a presentation by Ava, founder of Orange County Goddess Temple. Ava teaches about the Queen archetype and its importance for women’s empowerment and planetary transformation. She and Rabbit, a Goddess minister from San Francisco rocked the casbah and I signed up for her afternoon workshop, though as usual it was tough having to choose from such a tempting array of possibilities. I brought my Mum along. Sitting in circle our left hand on the belly of the sister beside us, sensing the energetic crown upon our heads we journeyed to meet our inner queen, sit upon her throne and feel the quality she wanted to bring forth right now. Ava invited us to share this aloud as follows, ‘ I am Queen Ava ….. and my quality is love.’ It empowered my mother’s sore head clean away! Saturday evening we had fun at the Camino all getting dressed up in our outfits for the masked ball. Koko, Mother of all Melissas and abundance personified, provided a full-on pre banquet feast for all the conference Melissas and showered us all with bindis to boot. I went as Lilith the screech owl with extra bindis. To feast and dance, to scoff and stomp, to whoop and swoop. Sunday dawned pregnant with cloud. We gathered at the Town Hall to process along the High Street and up to Chalice Hill for our customary drumming, songs, Lammas fire and shared fruit feast carrying our dolls in their various wild guises. Atop the hill the ceremonial group called in the directions. Heloise, holding Domnu, mother of Water in the South, gave such heartfelt and copious thanks that she elicited a very wet response from the heavens. Glorious! In the afternoon we gathered for a final time in the Town Hall to share gifts, spiral dance, sing and give thanks. The Goddess is returning, turning, turning. 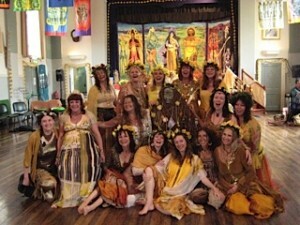 In Glastonbury she is celebrated in this wonderful annual event and throughout the year at the Goddess Hall in Benedict Street. For communion and meditation the Goddess temple is open most days from 10 to 4 in the Glastonbury experience, off the High Street. For further information see KathyJones’s website or the Goddess Conference online.